I've always thought I'm way better at communicating via writing and artwork. That is why I'm so drawn to painting as a mode to express myself. A common question I'm asked is "What's your story?" and I often ramble on sharing bits and pieces of my past without providing a cookie cutter elevator speech or "my story in a nutshell". I've felt pressure to work on creating one. However, there are so many intersecting layers of my identity and past that I feel condensing it into a quick, digestible story for you wouldn't be completely authentic. So I'll share some thoughts I wrote tonight - that of course struck me while in the bathtub - my time to shut off and check in with myself. Why do I focus on celebrating and empowering women and girls? Because it took me so long to become who I really am. To love myself and in turn - to love other women. I feel like I am just now coming alive! Living in my true skin, in my authentic self, and I'm 33 years old! It's been a long, long road getting here and I'm a constant, evolving work in progress. I just don't want other women and girls to spend years of their lives denying and diminishing themselves, hiding their truths, doubting themselves, always thinking what they have to say is unimportant... the way that I did. It's a cruel, silent suffering that isolates us from ourselves and from one another. It keeps us from being truly seen and from stepping into our greatness. And it breaks my heart. Up until my late 20's, I was the girl everyone else wanted me to be. Who my mom, my brothers, my boyfriend, my pastor, my professors, my husband - wanted me to be. I had no idea who Kimothy truly was. Growing up in northeast Ohio, I was socialized by my family, church, school, community, and media to fit the mold of a nice, polite, good girl. This construct was limiting, depressing and even destructive. My brother told me, "Girls don't listen to this. Here, how about this CD". My mom's remarks about my outfit choices - warning me that they might attract unwanted attention and implying it'd be my fault for wearing that. She told me to smile, squeezing my hand tightly at church, when I wanted to cry and yell. Their voices were so loud in my mind that I couldn't hear my own. I listened to them because my self-worth and value was contingent upon everyone else's approval. I felt so disconnected from myself. I was flailing and searching. My mom's death from breast cancer in 2009, when I was 25, only magnified my lack of self-awareness and identity. It sent me into a black hole of grief, self-destruction and eventually, on a quest to know my true self. Her death compelled me to fight for my happiness, because there weren't many pieces of it left. I was gutted. After a year and a half of marriage, I made my first move of speaking my truth (for once in my life) and told my husband I wanted a divorce. I was terrified. But then and there I decided I needed to start living for myself - listening to myself. I am so so proud of that scared, shaking, voice quivering 27 year old. I thank her everyday. Because she was brave, because she dipped into the depths of her darkest pain and came out anew - she has granted me the life I have now. I'm in tears thinking of her. Through losing my mother and ending my marriage, I experienced a reckoning of identity. Instead of maintaining the hand-me-down beliefs of female identity, religion, politics, cultural norms that I was raised with - I examined them with new eyes. I let go of the notion of already knowing and started to ask more questions, judge less, assume less. This resulted in me getting to know and love people who I might have previously shut out. And that's when I began to see a divinity and sacred love in everything. And in myself. A love that cannot be contained within church walls and cannot be claimed by only a certain group of people. It is inherent in everyone. I began to realize my own strength as I said no to people, projects, paths that weren't really for me. I started saying no to relationships and acts I did out of guilt, shame and obligation. I started speaking up more and asking for that raise, leaving that corporate job to start my own business, etc. etc. It was a muscle that developed over time and that I'm still developing. My inner voice became the highest frequency and that changed my life. When I fully embraced my creativity and sensitivity as my strong suit, not my weaknesses as I formerly thought, and found confidence in my own voice and beliefs - everything changed. After a break up three years ago, I hit pause on dating and took time to be alone. Essentially, to date myself! I travelled solo, read more, spent time with friends who energized me and eventually started painting with watercolors completely for my own enjoyment - without monetary strings attached - without purpose - because it felt good and it healed me. The old me would have looked at it as self-indulgent and unproductive. But it quickly became a powerful tool for self-discovery. The more I honed in on my artwork and shared it with others, I became awestruck by how it was received, especially by other women. The impact of sharing my truths with art + community astounded me. It still does. That is why I do what I do. And now that I see what can happen when a woman speaks her truth - I cannot UNSEE it. 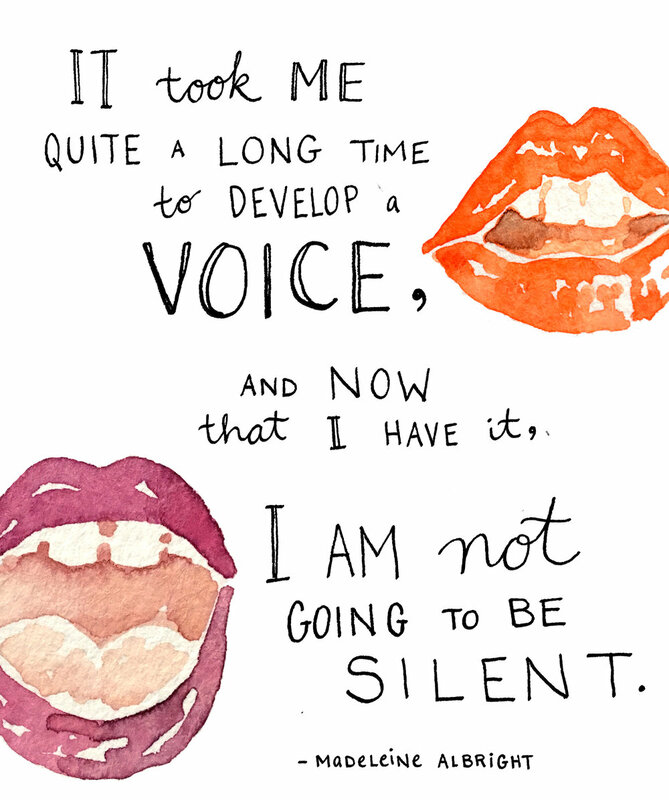 I can only forge ahead, remind myself to do the same and encourage others to speak up. I feel privileged to have finally had this awakening and feel called to continue creating and sharing. I am honored to use my gifts to remind you of how wondrous and powerful you really are.